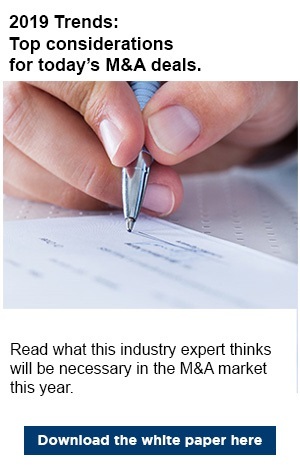 Mergers and acquisitions (M&As) are on the rise, and it’s critical for businesses to understand best practices and key considerations for a successful transaction. With more than 30 years of experience in middle market lending, including working capital and equipment loans, UMB Chief Lending Officer Tom Terry has extensive insight into this area. We’ve received many questions regarding the M&A landscape from buyers and sellers alike. The biggest trend we’re seeing in 2019 is strong and widespread interest in buying companies as an investment, and a huge amount of money is waiting to be utilized for that purpose. Family offices and individuals with significant wealth are nervous about the stock market. Low interest rates mean they’re not buying bonds, so they’re choosing to invest in companies instead. Because of the proliferation of high-net-worth individuals interested in buying, we’re also seeing increased private equity (PE) activity involving funds supported by multiple investors. Related to that, purchase prices are at historic highs, with earnings before interest, tax, depreciation and amortization (EBITDA) multiples reaching over 10. High multiples mean two things – first, that it’s a sellers’ market. Second, purchase price inflation has led to increasingly large “air balls,” or differences between purchase price and asset valuation, which determines the amount of debt a buyer is willing to take on to buy a company. Larger air balls add complexity to the financing process, as the lender must decide whether they’re willing to lend enough to bridge the gap. If the sum unsecured by collateral is too large, a bank may not approve the loan if the air ball hasn’t been accounted for elsewhere in the deal. For example, if a buyer purchases a company for $8 million and that company owns $5 million in collateral assets, is the transaction has a $3 million air ball. The purchase price gives the appearance of $3 million in additional net worth, but, in reality, the additional value isn’t there. From an accounting perspective, the buyer over paid by $3 million. Helping clients understand and account for this valuation gap has been a common theme in recent deals. Beyond the fact that there’s a lot of money circulating right now, there are several reasons a company may decide they want to be acquired. They may be out of funds, lack a succession plan to replace retiring leadership, or they may simply have hit a growth ceiling and don’t have enough capital to break through to the next level on their own. When a company hits the end of its business line, the owner has three options: family succession, creating an employee stock ownership plan (ESOP) for an employee buyout, or engaging an external buyout. On the other side, there tend to be two types of buyers. Strategic buyers are typically in the same business or industry as the company they want to acquire and are interested in buying that company as a means of eliminating a competitor or expanding into new markets. Investment buyers, on the other hand, are motivated by return potential. They believe in the company and feel that, by buying it, they will provide the strategy, technology, or capital it needs to grow. Whereas strategic buyers tend to be other companies, investment buyers are usually PE firms. Interested in learning more about UMB’s commercial banking solutions, check out our Commercial Resource Center. Tom Terry is the Chief Lending Officer for UMB Bank. He is responsible for commercial lending and credit quality. He joined UMB in 1986 and has nearly 30 years of experience in the financial services industry.